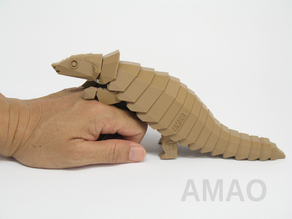 Another pangolin comes to life! Thank you so much for sharing this amazing model. The individual parts loosened up very easily, nothing was fused. The legs were a bit too loose, so I printed them again at 95% and they clipped in more tightly. I changed colors at 7.55mm, 10.55mm and 13.55mm to create the stripe effect. Very nice! How did you go about getting the gray stuff on the head?